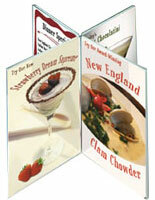 This menu card holder is intended for use with 4" wide x 9" high signage. 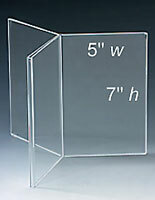 Each panel can hold two sheets of paper back-to-back to create a six-sided display. 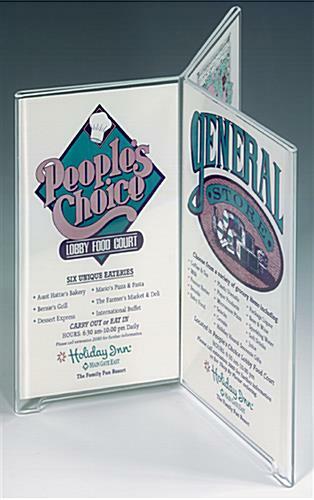 This menu card holder, also known as a table tent, is used in restaurants to advertise specials and promotions on the table tops. The relatively small footprint takes up little space on a tabletop, while providing a large amount of advertising space. 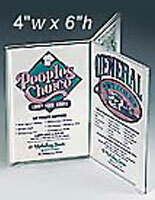 Each menu card holder, such as a table sign, features a unique acrylic fold-over design with openings in the top and bottom. To change out signage, simply slide the old graphics out and insert replacements. Place this menu card holder in the center of a table setting to allow all of the guests a clear view of the advertisements. The acrylic provides an unobstructed view of the entire sign. Each menu card holder has .25" high feet that raise the display away from table surfaces. 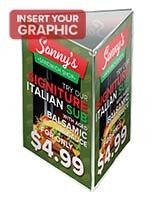 These permanent attachments minimize the chances of the signage from absorbing any moisture or spills that may occur. 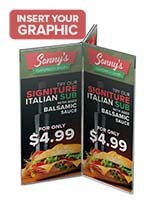 This menu card holder is offered on this site with or without the feet. 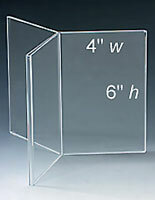 This acrylic sign frame can also be used in retail locations or other commercial environments to post information signage or upcoming events. Place this menu card holder in hotel guest rooms to announce restaurant hours, TV channel listings and other pertinent information. The uses for this sign display are practically endless. 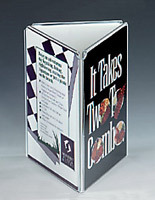 Buy this menu card holder in large quantities for even greater per unit savings. Excellent Quality - Blazing Fast Delivery! We ordered one of these a few weeks ago for our trade show booth - got it within 3 days and my boss liked it so much, she had me order several more. Heavy duty, crystal clear acrylic, allowed us to show both sides of a two-sided printout - visible from all directions, reduced need for additional displays.